This temple is the home of Shiva worshipped as a Shiva Lingam in the form of Arunachaleswarar (Annamalaiyar) and the Goddess Unnamulai Amman (Apitakuchambal, Parvati). It is one of the largest temples in India. This greatest of Saivite shrines, is set within a sprawling 25 acre temple compound and draws hundreds of thousands of pilgrims every full moon. It is associated with the element Fire and regarded as one of the Pancha Bhuta Stalams; the other four Stalams being Tiruvanaikkaval (Water), Chidambaram (Space), Kanchipuram (Earth) and Sri Kalahasti (Wind) respectively. Shiva is said to have manifested himself in the form of a massive column of fire, whose crown and feet, Brahman and Vishnu attempted in vain to reach. In his compassion the Lord conceded to their request of appearing in the form of a Sivalingam and thus vanished within the hill. Immediately a Sivalinga appeared and overwhelmed with joy, Brahma and Vishnu caused a temple to be erected through the divine sculptor Mayan. 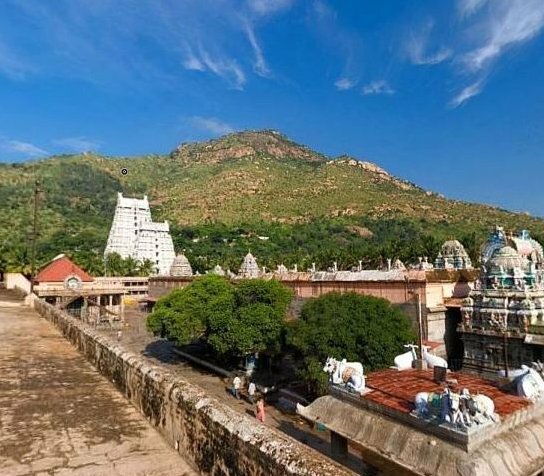 The town of Tiruvannamalai is said to have nine entrances — from where the hill of Arunachala can be seen from up to 15 km. Arunachala, at an elevation of 2,668 ft, towers over and behind the temple. The hill and its environs and the town itself has been known for its long association with Yogis and Siddhas. This temple is a result of building activity over the last one thousand years. However, even seventh century Tamil poetry glorifies this temple and all four Saivite Saints: Appar, Sambandar, Manikkavacakar and Sundarar have sung its praises. It was also at Arunachaleswarar that Arunagirinathar began composing his immortal work Tiruppugazh. The outer enclosure surrounding the temple compound has granite walls 30 feet high. The temple has four Gopurams (towers) on its outer boundary. The biggest tower which provides the main entrance to the temple, is situated in the east and known as the Raja Gopuram. It has 11 tiers, with a width of 135ft by 98ft at the base and soars to 217ft (65m) in height. Ammani Ammal Gopuram (171ft), Thirumanjuna Gopuram (157ft) and Pey Gopuram (144ft) are the names of the north, south and west towers respectively. These towers were added as tributes by emperors at different times from Veera Rajendra Chola in 1063 A.D. to Krishnadeva Raya around 1690 A.D.
A Nandi faces the main shrine in each of its five prakarams. On entering the temple through the East tower the big structure one faces on the right is the Thousand pillared Hall. It is believed that it was built by Krishna Deva Raya. The sacred pool, Sivaganga, which is to the south of the Kambathu Ilayanar Mandapam is used for sacred abulations to the Deities in the temple. The third prakaram surrounds the roofed second prakaram which is home to deities associated with Shiva, which in turn surrounds the shrine of Annamalaiyar. The fourth prakaram includes the Brama Tirtham which is located in front of the Bairavar temple, and its eastern gateway Vallala Gopuram holds a statue of King Ballala. The third prakaram which dates back to the 12th century AD has several Linga Shrines, and the Kili Gopuram Entrance. In the East side of the prakaram stands the Flag Staff while the Northern side is home to the massive shrine of Unnamulai Amman. The Sanctum Sanctorum of the sacred Annamalaiyar is reached by the main entrance in the east. The sanctum itself is described in texts that were written as far back as 750 A.D. Within the sanctum, Annamalaiyar, personified, is present in Linga form. While the Avudiyar is round, the Rudra baga is covered with gold plate. Nearby is the Meru Chakra, the Bedroom Idol and a bronze idol of Yaga Sakti Amman. The Devi shrine is opposite the Siva shrine and was renovated last century by the Nagarattars and thus exhibits more contemporary architecture. In its sanctum is enshrined Unnamalai Amman, 3ft tall, radiating peace. The Mandapam, outside the Sanctum, is also known as the Asta Lakshmi Mandapam, and has beautiful pillars worked with exquisite art. An elaborate protocol of worship services marks each day at the Tiruvannamalai temple where about a hundred and fifty people are attached to the temple including priests, musicians, singers, carpenters, potters, washermen, palanquin bearers, garland makers, administrators and guards. The day begins with the ceremonial arrival of Ganga to the shrine, from a tank in the Southern part of the town on an elephant through the Southern, Tirumanjana Gopuram. This water cleanses the entrance to the second prakaram, and then the next ritual involving the waking up of Shiva and Parvati in the bedchamber. The Shiva-Meru returns to the Annamalaiyar shrine while the image of Parvati returns to the Unnamulai Amman shrine. the first one at 5.30 am, and the last one at night where the Shiva Meru and the image of Parvati is carried in a procession into the bed chamber. Each service is accompanied by chants of invocation, dedication and praise.